Love iced cream cones but hate the iced cream? Then you'll love these Cupcake cones on Instructables with plenty of instructions (naturally) to make your own sweettreats at home. Delicious, clever, and surprising, these cupcakes impersonating ice cream cones are sure to delight! Now that's a quote that I can't begin to dispute. 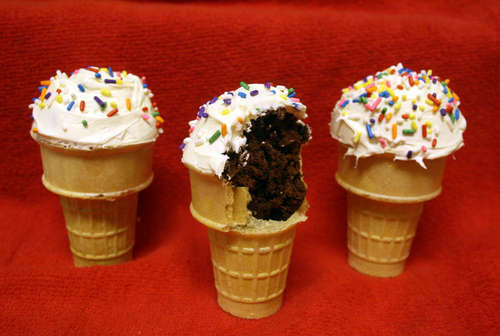 What's horrible about these is that the cone always is stale by the time it goes through the cooking process. Trying to eat the cone is like pulling on rubber. God, I remember these from 3rd grade bake sales. Some of them were actually edible. My mom has made these for my birthday since I can remember. I now have kids of my own, and they love them too! Sah-weet! Never seen these before, but they got me very excited to try one! The worse thing about a cupcake is peeling off the paper and having to get your fingers all messy from the cake, this is the answer to that.